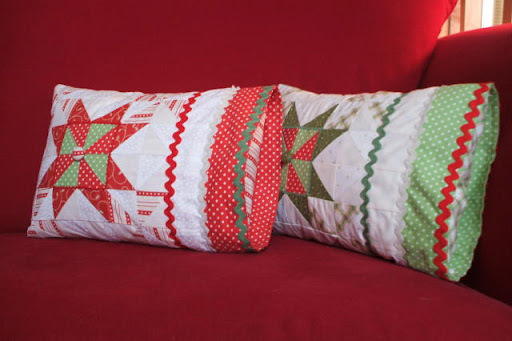 My quilty friend , Toni , and I decided to try some quilt contests this year, and actually finish and enter them. I made the quilt for the Piece, Love and Quilts contest on my own. Together we decided to buy fabric and enter the quarterly contests through American Patchwork and Quilting and allpeoplequilt.com. Toni loves red and I love green, we wanted to change the pattern up a bit…’cause y’know…I don’t follow rules (or at least patterns) well. We were in the top ten, but not the winner. It was fun making them together, so winning doesn’t really matter. Right?!? The next one was the pincushions…a crazy small (?!) pic, again, Toni’s is the red one, mine is the green one. We added wool roving as stuffing to act as a pin and needle sharpener. These also made it into the top ten, but didn’t win. There was some pretty cute competition…so I can see why. 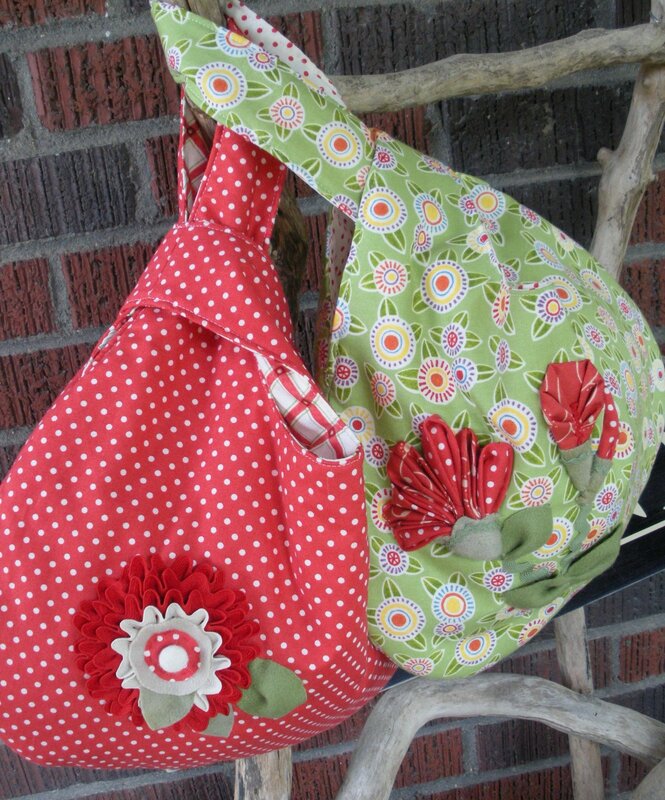 This week we completed the Grab Bags for the 3rd Quarter, complete with red-and-green-and-white-rick-rack-goodness! I’m sorta jealous, ’cause this time I really like the red one better! Maybe we can work out a trade?!? So cute! All of the creations. But I’m a bag junkie, so I’m partial to the bags. I really like both! 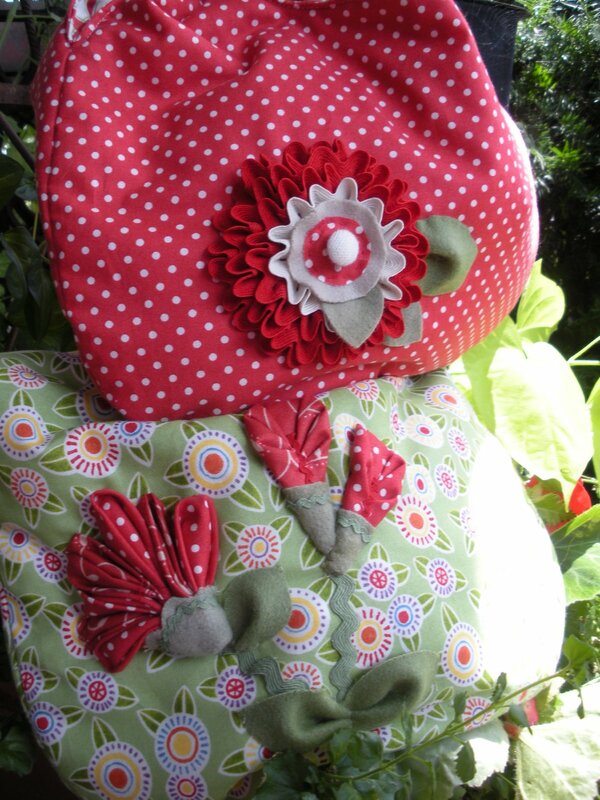 Love the bags and the pincushions are cute….oh and the cushions…LOL……good luck with the grab bag votes….! !